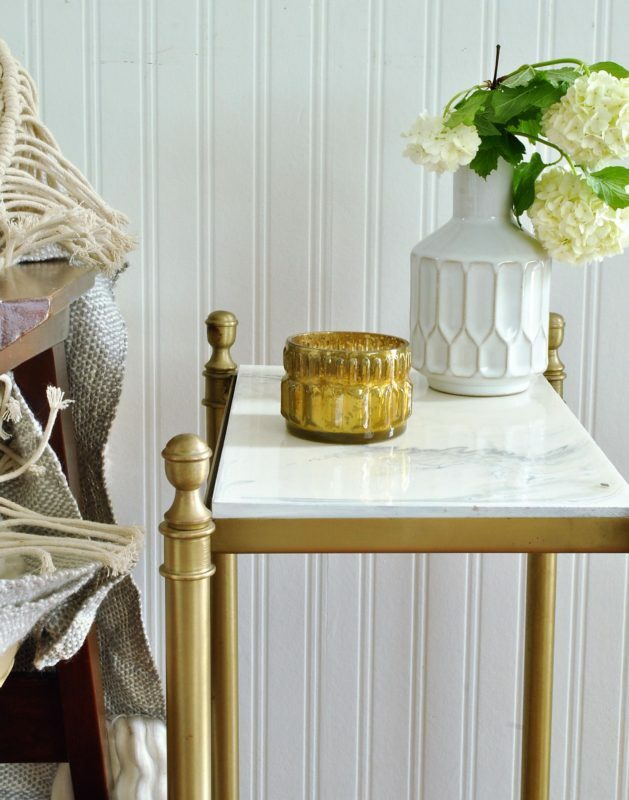 I’ve a vision for making a faux marble table made with Pouring Medium for a while. When I did my first Pouring Medium project, I was hooked! It is so fun, and so addictive! 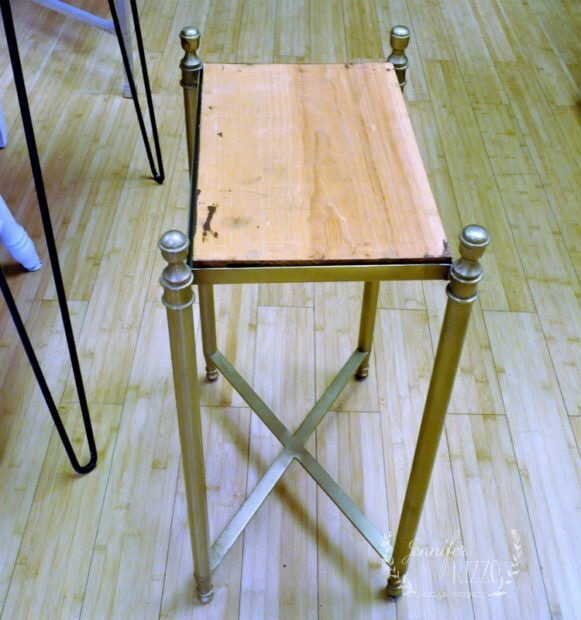 I can’t wait to try this on all kinds of surfaces, and I thought this small table was the prefect start. I do want to let you know,the pouring medium isn’t heat proof, for direct food contact, or for outside use. I decided a small side table would be perfect, because it’s really more of an accent piece, instead of something that needs to take a lot of wear and tear everyday. I bought the brass base of this table a few years ago. You know I can’t pass up a bargain, or a project! The top was missing, so we added a wood piece that had just been stained (It was probably supposed to have a marble top to begin with. ), and was perfectly functional. I just knew I could bump it up a bit with the faux poured marble. You can also see how I painted my kitchen island here with a different marbling technique. I love how it turned out! I’m actually going to break this up into two posts, because it is really a picture heavy project, and I want to cover pouring the top coat separately. I painted my edges white first. My table top lifts out, so I was to do it on a flat surface. 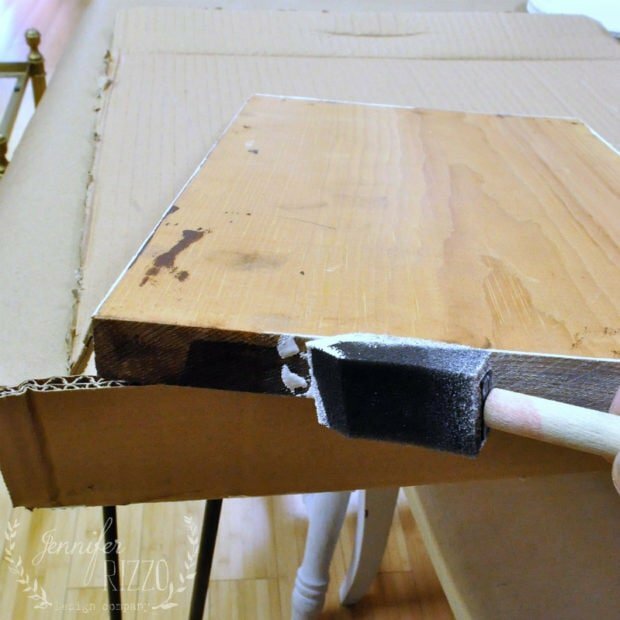 If you are doing a table top that doesn’t detach, you might want to tarp off the base of the table,and the floor. For this project, you’ll need a small table, soft paint brush,DecoArt Pouring Medium , Top Coat and three colors of paints in the Satin Enamels line of paint for durability. The colors are : Satin Enamels Pure White , (light gray)Satin Enamels Smoke Grey and (dark gray) Charcoal Grey . 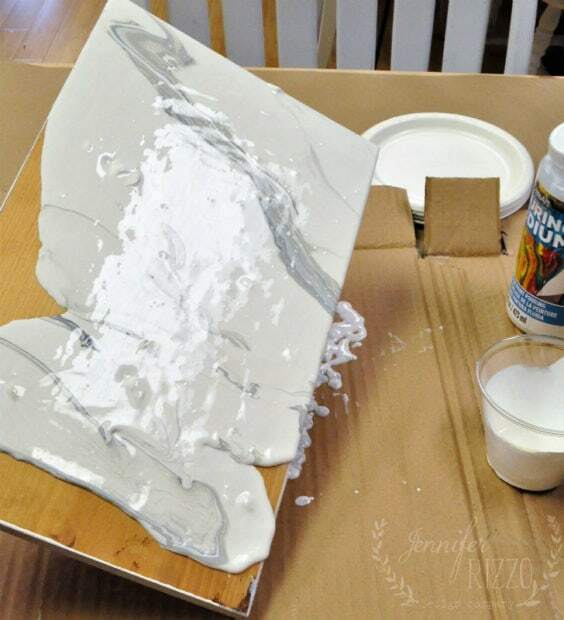 You’ll also need to protect your surface like a tarp (I used cardboard), small cups and stir sticks for mixing, and something to pour off the excess paint into such as a disposable pie tin, or baking tray. How much paint you use, depends on the size of your surface. My table is about 14 inches by 16 inches, and I made about 1/3 cup total of light gray paint and Pouring Medium together, 1/4 cup of dark gray, and 1/2 cup of white. 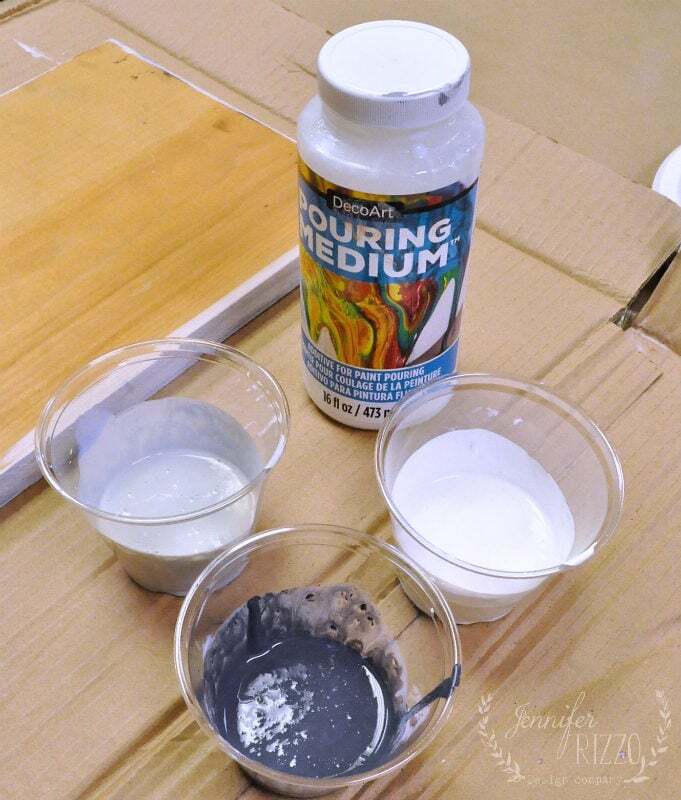 To start mix your paints with the pouring medium in a 50/50 ratio. This will give it a fluid pour. Stir to mix thoroughly. After mixing your paints, you are ready to pour them into each other. 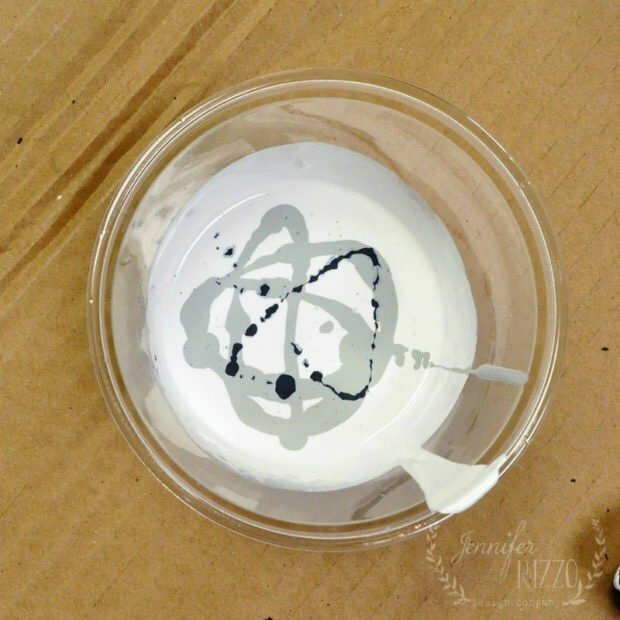 Pour the light gray into the white in a bit of a circular pattern. Drizzle the dark gray on top of that. 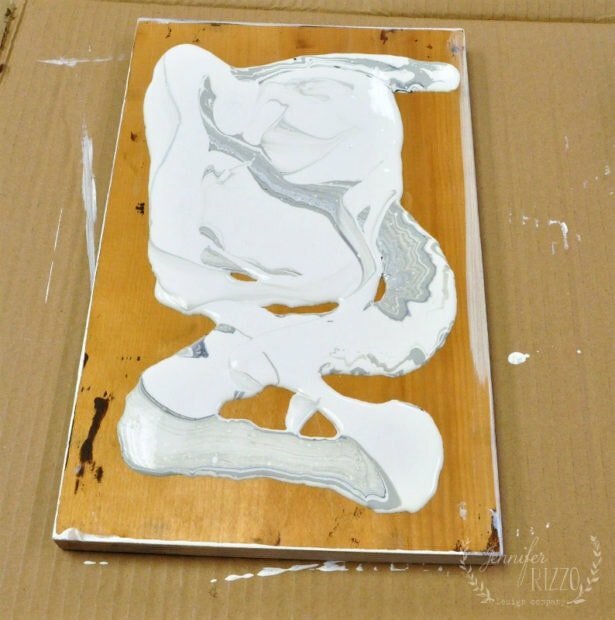 Pour your paint mixture onto your table top/board. 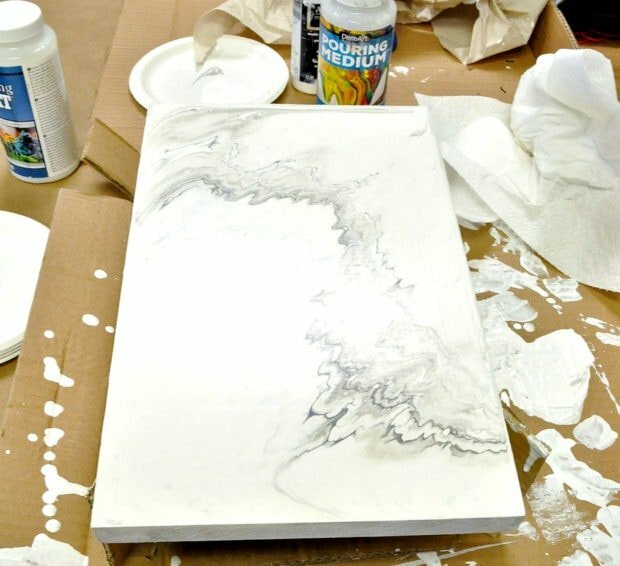 When I poured mine, I kind of used a back and forth motion, to get a more linear look for my faux marble made with pouring medium. Gently pick up the board, and tip it side to side, letting it run in a linear pattern, trying to maintain some of the natural “marbling” that happens. Go with the flow too, and see where the pattern goes! Once you have the top the way you like it, and it’s completely covered, place it on a flat surface. 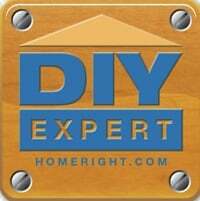 Remove any drips on the edge with a paint brush. Let it sit on a flat to dry for at least 24 hours, in a room with low humidity, where it won’t be disturbed so the paint hardens completely before adding the top coat. 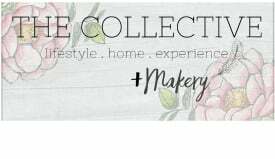 You can see the Top Coat process in this post!